The 53 files released include 23 videos of in-car camera footage, 28 body-worn camera videos and two 911 audio files. The latest media drop adds to the previously released helicopter footage of the shooting incident. ​In the videos of body camera footage, responding officers are seen waiting roughly five minutes from the time that Clark was shot before they opted to get closer. Before officers even begin CPR, they spend about another minute searching Clark's body and handcuffing him. ​Clark was pronounced dead at "21:42" by a fire department medic after being deemed "nonreactive" to life-saving tactics. Bennet Omalu, the forensic pathologist who conducted an independent autopsy on Clark at the family's request, previously stated during a news conference that it took anywhere from three to 10 minutes for the 22-year-old to die. Omalu later commented that it was unclear whether Clark would have survived if medics had responded sooner. Sergeant Vance Chandler, the spokesperson for the Sacramento Police Department, told the Sacramento Bee in a story published Monday that the department would be looking into whether medical care was provided quickly enough. Another one of the major revelations in the release is the multiple times that officers muted the microphones on their body-worn cameras. In one instance, after an officer examines the backyard of a homeowner, she meets up with another officer to recount what she believed happened on the night of the shooting. 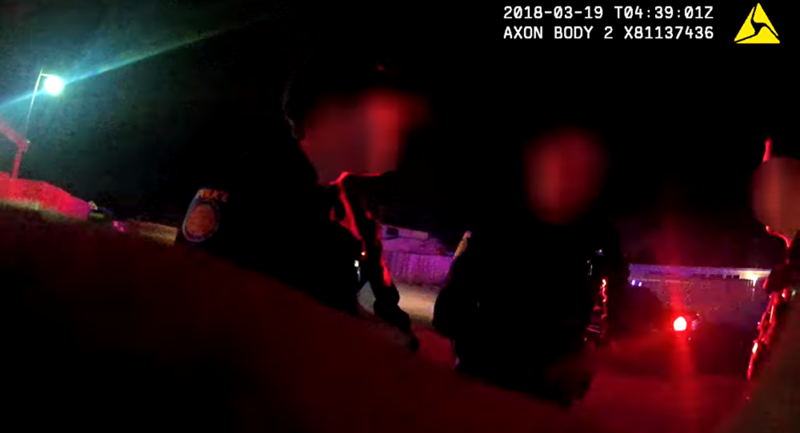 ​"We got a call, somebody is breaking into things, then he breaks into this guy's slider," she told her fellow officer before saying, "um, hold on" — her body cam audio is cut for the remainder of the recording. In another video, a different cop cuts off his audio feed while investigating the backyard of the same homeowner the female officer was clearing out. This officer's audio does not pick back up. ​A third video shows a group of officers gathering at a church near where the shooting took place to look for potential damage. As the cops convene, the apparent leader of the group orders the others to mute their microphones. ​Before a conversation even begins among the group, the unidentified officer says "mute it." After two of the cops respond with a "sir," the first officer again says, "mute it." Two officers reply with a "yeah." The fourth officer quickly chimes in with "wait" before the audio goes silent. Chandler told The Washington Post on Tuesday that the procedure for muting the microphones on body-worn camera is also part of the department's investigation. Clark was shot by Sacramento officers on March 18 in his grandparents' backyard. At the time of the shooting, officers believed that he was armed; however, upon inspection of the grounds officials only found a white iPhone. Clark's autopsy showed he was facing away from the officers when they shot him eight times in the back and side.